Some glaciers float on the ocean around Antarctica and Greenland. Petermann Gletscher in North Greenland is one of these. 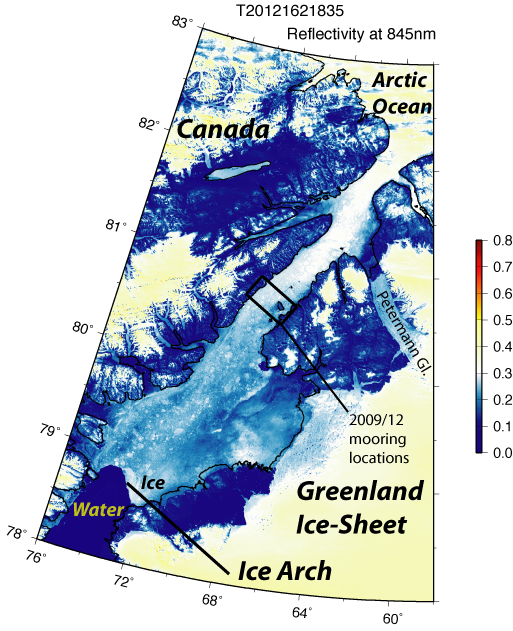 It spawned massive Manhattan-sized ice islands in 2010 and 2012. Could tides influence when and where such break-ups occur? After all, the tides under the floating glacier move the ice up and down. But how does a 50 km long, 15 km wide, and 300 m thick floating glacier pivots about its “hinge?” Does it do so like a rigid plate of steel or does it bend and buckle like jelly? 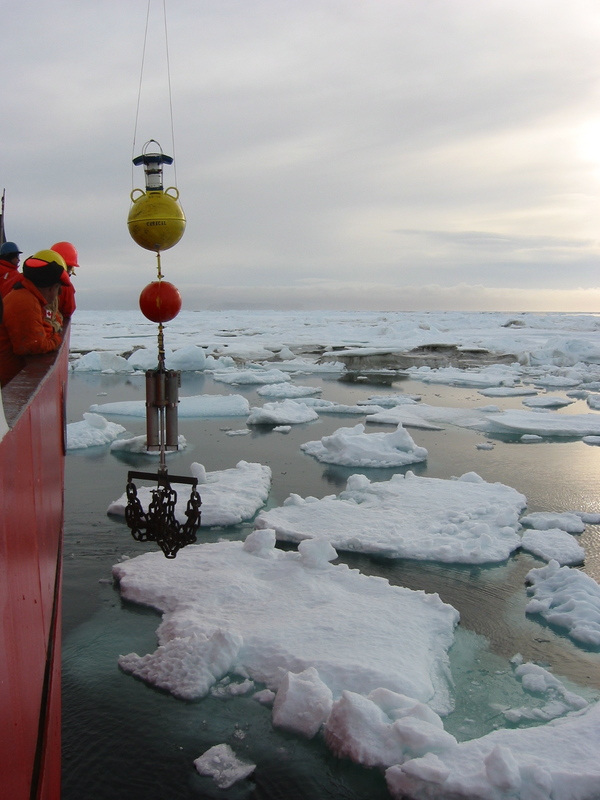 I do not know, because nobody has measured the tidal motions of Petermann’s floating ice. 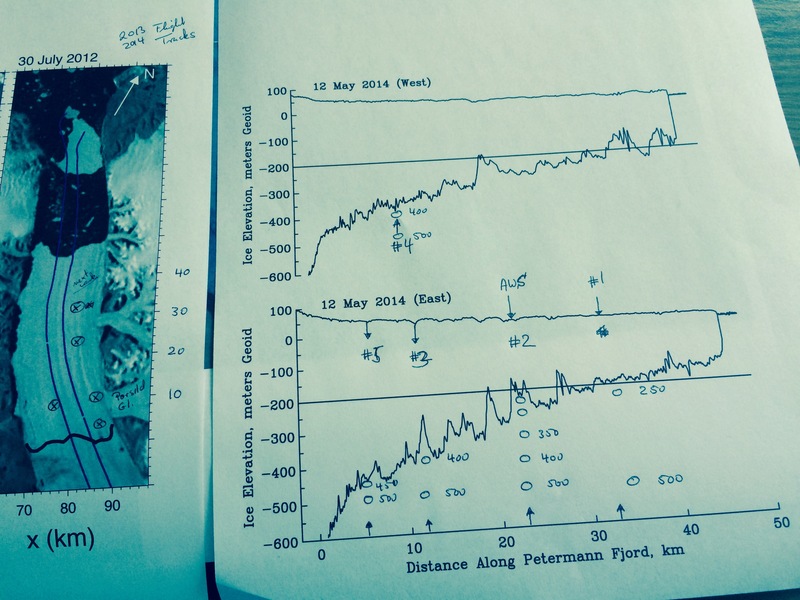 So, one of many projects this summer will be to measure tides on Petermann with fancy GPS systems. 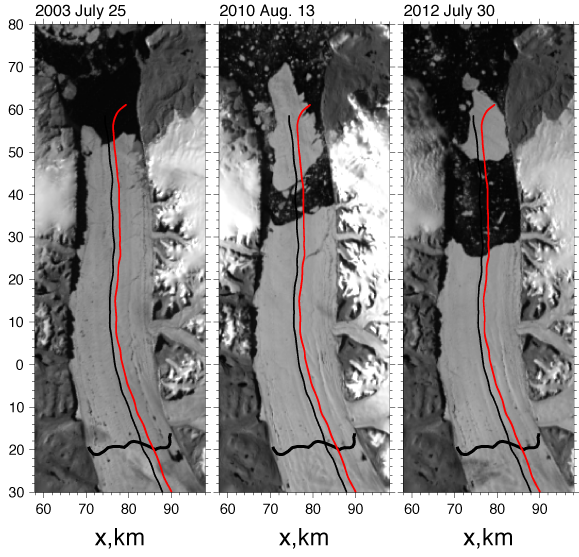 Shape of the floating portion of Petermann Gletscher from laser altimeters (right panel) along two tracks flown along the glacier in May of 2014 (left panel). Martin Jakobsson of Stockholm University posed these questions, sort of, when he asked us American oceanographers, if we had any fancy GPS units to work with one he plans to put high on a cliff overlooking Petermann Fjord. He needs exact positions to map the bottom of the ocean. The cliff-GPS station is fixed while he moves about in a small boat that also has a GPS. Taking the difference of the raw travel times received by the cliff-GPS and the boat-GPS, he can reduce GPS position errors from several meters to several centimeters. People call this differential GPS and he wondered if we oceanographers had any use of it to perhaps give him the tidal corrections he also needs as the measures bottom depths from a boat. Well, this was not initially part of our plan and we did not get funded to study the glacier or the tides under it, but his question got me thinking while Alan Mix of Oregon State University did some organizing. One always squeezes extra science into such great opportunities. Discoveries lurk everywhere to inquiring minds. 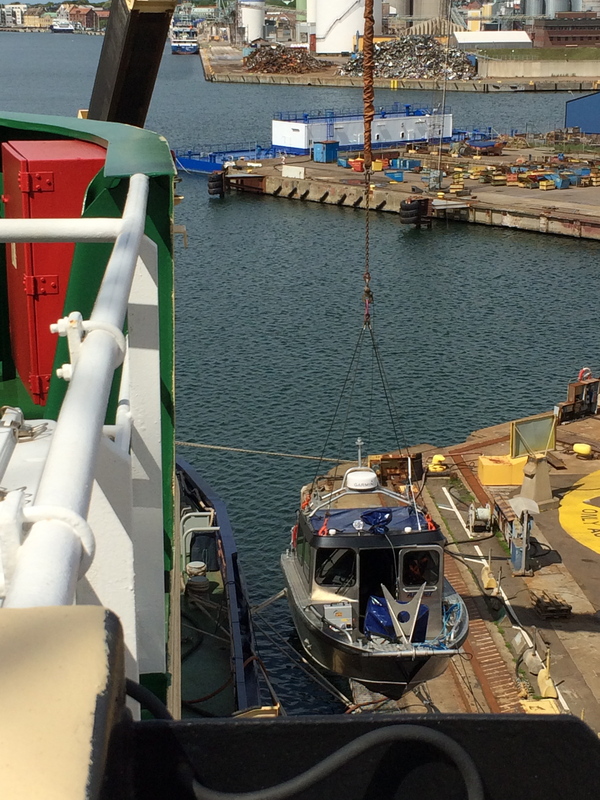 Small survey boat loaded onto I/B Oden in Landskrona, Sweden, June 2015. UNAVCO, a non-profit university-governed consortium, facilitates geoscience research and education using geodesy. We challenge ourselves to transform human understanding of the changing Earth by enabling the integration of innovative technologies, open geodetic observations, and research, from pole to pole. “Geodetic observations” are measurements of locations on the earth’s surface. In the old days surveyors walked about with sextant, clocks, tripods, and optical devices to fix a location and reference it to another. Nowadays satellites and lasers do this faster, but I digress. Suffice it to say, UNAVCO is giving us 3 fancy GPS system to carry with us to Petermann Gletscher to make measurements of tides on the ice. So we can pick 3 locations on the ice where we leave these GPS for the 3-4 weeks next month. I have never done this before, so there will be lots of new learning. Navigation during early Arctic exploration. 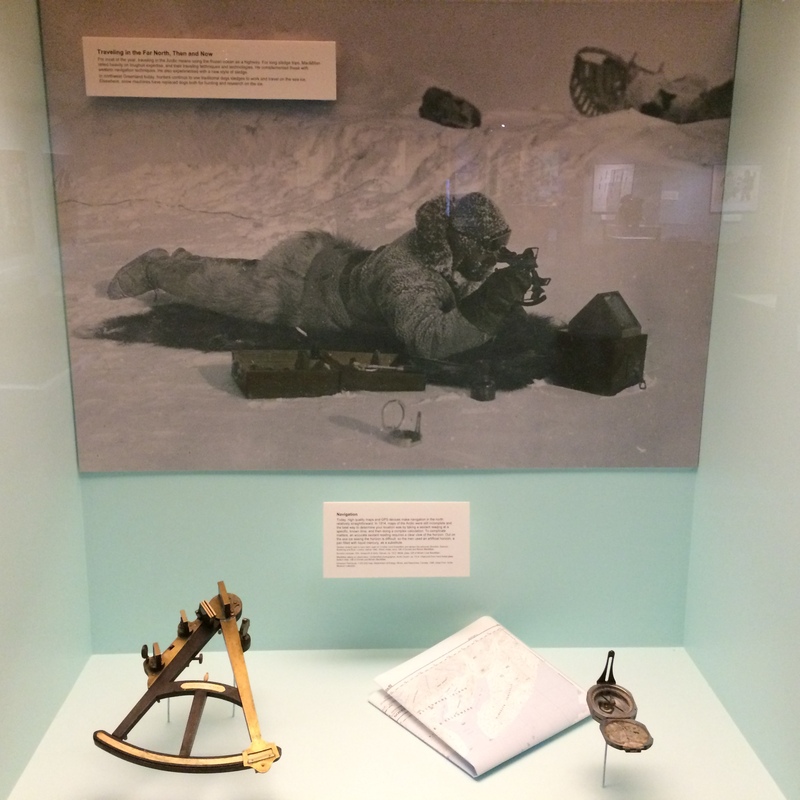 Photo taken during a visit of the Peary MacMillan Arctic Museeum at Bowdoin University in Brunswick, Maine. I have worked with tides since plunging my head into tidal mud-flats of north-west Germany where I grew up and camping on the shores of the Conwy Estuary in North-Wales where I collected data for my MS thesis. Below I show a 4 week record from three locations in Nares Strait where the tidal elevations range from more than 4 meters at the southern entrance to less than 2 meters in Hall Basin next to Petermann Fjord. 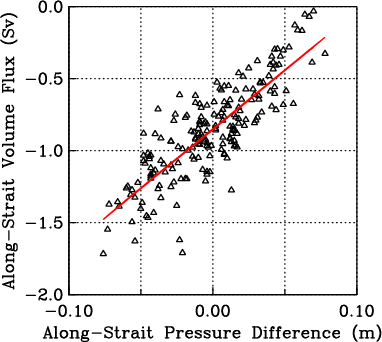 The data are from bottom pressure sensors that were deployed for 3-9 years, but I here only want to show the spring-neap cycle. 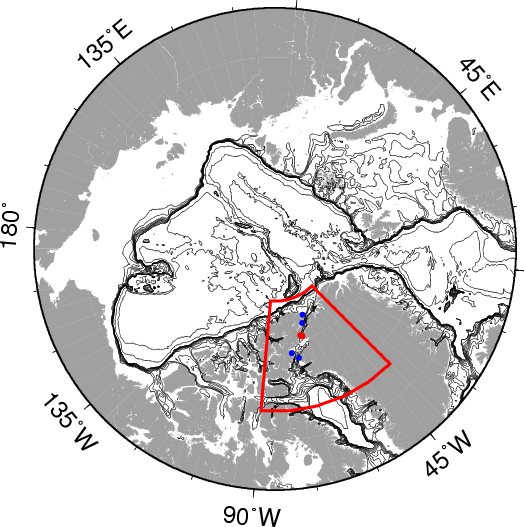 So we already have some idea on how the tides in the ocean next to Petermann Glacier behave. 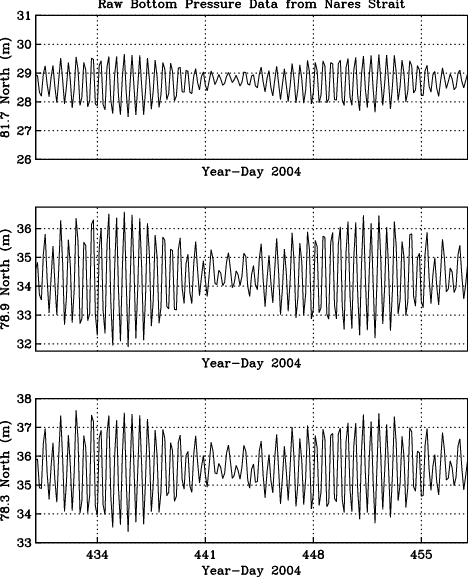 Sea level fluctuations in meters for 28 days at Discovery Harbor or Fort Conger, Canada near 81.7 N latitude (top), Alexandra Fjord, Canada near 78.9 N latiude (middle), and Foulke Fjord, Greenland near 78.3 N latitude (bottom). Models of tides in Nares Straits do really well if, and only if, the bottom topography is known. And this is where Martin’s mapping of the ocean floor in Petermann Fjord and our tidal observations on the floating glacier come together: We both need good bottom topography, we both use fancy GPS, and we both need to know tides to get accurate bottom depths and we need to know bottom depths to predict tides. ADDENDUM (Nov.-7, 2012): Time lapse video from Delaware Sea Grant. 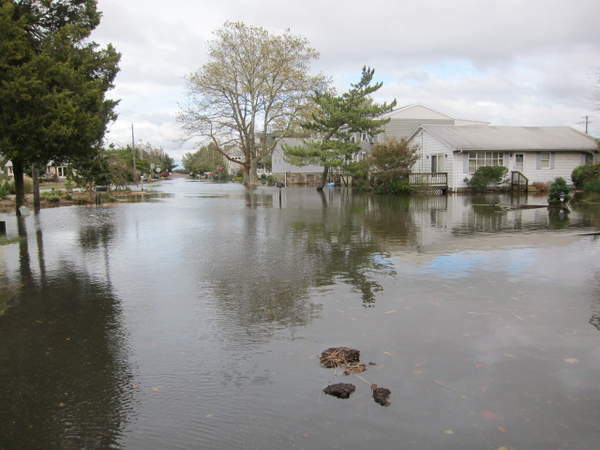 Rising seas and flood waters cause most of the damage during storms such as Sandy did last week. Tides, waves, and storms all contribute. We can debate how global warming impacts any of the above, but the arguments are involved. So lets assume, that neither tides, waves, nor storms are impacted by global warming, but that the globally averaged rise in sea level over the last 50 or 100 years is. This global warming induced sea level rise is about half a foot in 50 years (3 mm/year), but why would we care about global averages, when we live in Delaware? Furthermore, why worry about the whimpy surges we get ever 2-3 weeks. We don’t, we worry most about the most extreme events like Sandy and want to know how often they occur. Below I show a Sandy-like event to occur about once every 10 years. Furthermore, over time Delaware’s most extreme storm surges are rising twice as fast as global averages do. So, how much does the global warming impact our local flooding in Delaware? Largest storm surge at Lewes, Delaware each year from 1957 to present. 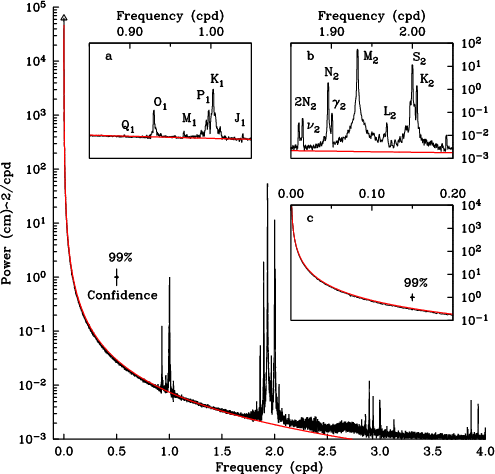 The red line is a linear fit to the data. 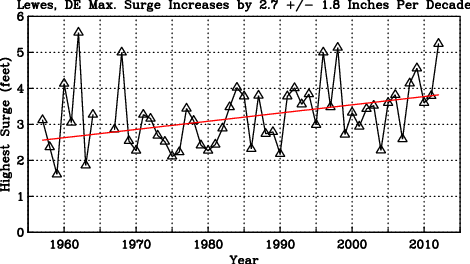 The slope indicates that the largest storm surge increase by almost 3 inches every 10 years. On average each year has a larger largest surge than the year before. While this steady increase by 2.8 +/- 1.7 inches each 10 years is statistically significant (95% confidence), picking the extreme each year is perhaps not the best statistic as extremes do not happen often. Please note that a 95% confidence means that there is a 5% chance that the true increase is either smaller than 0.9 inches/decade or larger than 4.5 inches/decade. This increase of 1.4 +/- 0.2 inches per decade (95% confidence) is more in line of the global average. The uncertainty in this trend is smaller than that of the trend for the extreme, because the median sea level varies little from year to year, while the extreme value varies more from year to year. So, from these results we can conclude, that while the mean or median sea level at Lewes increases by perhaps 1.5 inches in 10 years, the extremes increase twice as fast. So, storm surges like Sandy will become more common than they are today mostly because of global warming. Over the last 50 years we had at least 5 such events in 1962, 1968, 1996, 1998, and 2012. So, on average we have a Sandy-type storm surge greater than 5 feet every 10 years. This contradicts a Wilmington News Journal article today which quotes John Ramsey to describe “… Sandy as a 1-in-200-years storm, unlikely to be repeated anytime soon. That could give coastal communities time enough to deal with the real threats and realities of sea level rise and climate change.” There is no such time, as it is mis-leading to describe Sandy as a 1-in-200-year event when it has happened about every 10 years during the last 55 years. Instead of a 0.5% percent chance of a Sandy-like event to hit Lewes each year, I would raise this chance to be larger than 10%.